Posted on Tue, Dec 20, 2011 : 3:08 p.m.
Da'Shonte Riley has received an eligibility waiver from the NCAA that allows the transfer to start playing for the Eastern Michigan men's basketball team immediately, the school announced today. The 7-foot center, who followed new Eagles coach Rob Murphy from Syracuse back to his home state, will play tonight in a 7 p.m. game at Radford. 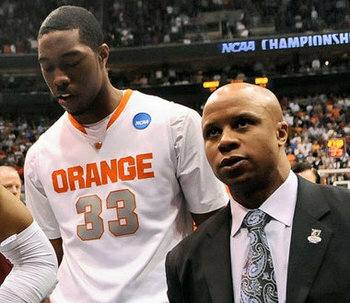 DaShonte Riley and assistant coach Rob Murphy walk off the court after Syracuse's loss to Butler in the 2010 NCAA Tournament. The two are reunited at Eastern Michigan, and Riley will play his first game in an Eagles uniform tonight. "We are thankful to the NCAA for granting Da'Shonte the waiver for him to become eligible for competition right away," Murphy said in a statement. "Da'Shonte transferred to EMU so he could be closer to his family in a difficult situation. I'm happy that he is able to give his family the support they need." Riley, a graduate of Detroit Country Day, played in 17 games as a freshman at Syracuse in 2009-10, averaging 1.4 points and 1.5 rebounds, and was granted a medical hardship in 2010-11 after breaking his foot. The NCAA granted Riley's transfer a hardship waiver, which means he doesn't have to fulfill the one-year waiting period typically associated with a transfer between Division I schools. When his transfer from Syracuse was announced in June, Riley's mother, Colette Anderson, told the Syracuse Post-Standard that he was concerned over health issues that plagued both of his grandparents. Riley becomes the third center on the Eagles’ roster, joining 6-10 Matt Balkema and Kamil Janton. Balkema is averaging 6.5 points and 3.5 rebounds in 21.9 minutes per game for the Eagles. Janton has contributed 2.3 points and 3.3 rebounds in 16.7 minutes. The Eagles (4-6) will attempt to snap a five-game losing streak against 3-9 Radford tonight in Radford, Va.
Riley was one of three Division I transfers the Murphy lured to Eastern Michigan. Glenn Bryant, a 6-7 forward from Arkansas, and Daylen Harrison, a 6-6 forward from Wyoming, will be eligible to play for the Eagles next season. Both will have junior eligibility.